A lush green lawn, the objective of many homeowners, is actually the result of hard work throughout the year. Fall is a busy time for lawn care as this is generally when overseeding takes place. Overseeding repairs thin, bare areas of the lawn due to drought, insect and heat damage to yield a thick, healthy and weed-free lawn. Mow the lawn lower than normal with a riding or walk-behind lawnmower. Cut fescue grass, for example, to a height of 2 inches as opposed to the 3- to 4-inch height at which it is normally cut. Bag or rake clippings after mowing. De-thatch the lawn area to be overseeded. Use a rake or de-thatcher behind a riding mower to pull and rake accumulations of thatch from the grass. Gather and remove all accumulated thatch from the lawn. Aerate the lawn area to be overseeded, using the core aerator. Aerate the lawn completely in one direction with back-and-forth passes, then 90 degrees perpendicular to ensure good aeration. Use the spreader to apply grass seed such as fescue at a rate of 2 to 4 lbs. per 1,000 square feet. Set the spread rate on the spreader according to the manufacturer's recommendations. Apply half the seed with the spreader in one direction and the other half 90 degrees perpendicular to the first direction. 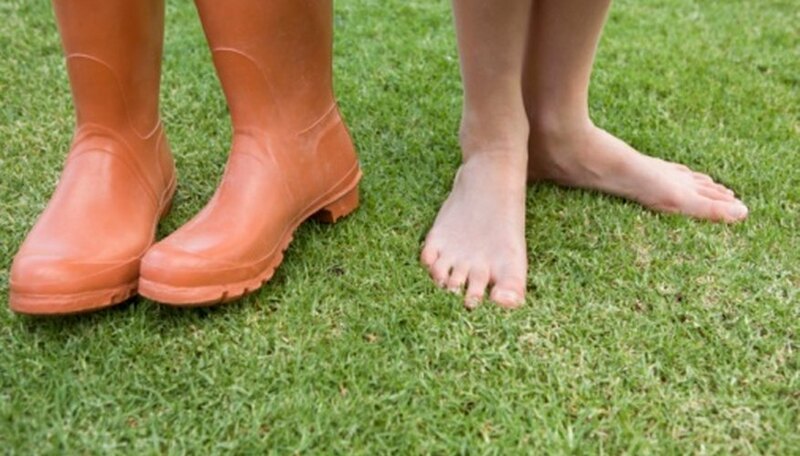 Apply a balanced starter fertilizer with a ratio of 24-24-4 to the seeded lawn. Apply the fertilizer based on the manufacturer's recommendations for overseeding and set the spreader accordingly. As with the grass seed, apply half the fertilizer with the spreader in one direction across the lawn and the other half 90 degrees perpendicular. Apply a light covering of straw to the overseeded lawn based on personal preference. Lightly scatter straw on the lawn with special attention on bare or thin areas to cover the seed and fertilizer. Water the overseeded lawn based on local weather conditions. Apply water daily if the soil is dry and the forecast does not call for rain. Continue to water the lawn as needed to keep it moist and encourage germination. You can rent aerators and de-thatchers from builder's supply or tool rental companies.